This is a great book if you are interested in learning how to cook Indian food or would like to dabble into the Ayurvedic principles behind meal preparation. The book reviews the basic concepts of Ayurveda and explains how to set up an Ayurvedic kitchen. It includes more than 100 recipes of Ayurvedic cuisine and menus that will work for the entire family regardless of doshic constitution. If you are interested in incorporating Ayurveda into an American diet, the book is a little lacking. I also dislike the fact that there are no photos in the cookbook section. 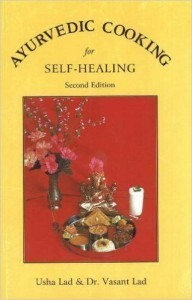 Buy Ayurvedic Cooking for Self-Healing by Usha Lad and Dr. Vasant Lad on Amazon.